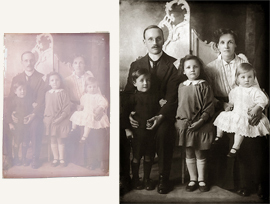 Photo Restoration Surrey, Hampshire & Sussex - Photographs Forever, UK. You may not realise there is a problem until you take a look at your photo collection after many years of storage. Our precious photo collections are in fact fading away and in time may well be beyond recovery. There is also the possibility of loss or damage in the case of fire or flood for example. It is a very good idea to consider restoring your special photographs or even your entire photo collection in order to stop the unavoidable deterioration that will take place no matter how carefully your photos are stored. Once restored, the photos can be stored and shared on CD or memory stick, as well as long-term safekeeping. Once you have digital copies you needn’t worry so much about further damage because digital images do not degrade. We can use these digital images to make prints on archive paper, which will last over 100 years with no signs of degradation. The restoration process improves the quality of the original photograph – by removal of spots, stains, marks, tears as well as improving contrast, brightness, colour balance and enhancement of detail, focus and sharpness. Adding colour to black and white photographs, as well as being able to make high quality enlargements. Photographs Forever provide a personal, reliable and top quality photo restoration, photo retouching, and photo editing service that is realistically priced. You will receive service that you can trust as we are passionate about all aspects of the work undertaken as well as the importance of you making the most of your precious photographs. See for yourself the results that we’ve achieved on our examples page. Our photograph restoration services include: Repairing tears and creases, removing folds, replacement of backgrounds, restoration of wedding photos, correcting colour balance, restoring faded images, restoring digital photos, digitally removing mould damage, scanning and restoring negatives and slides as well as prints, creating enlargements or scanning only. Our photograph retouching services include: Removing unwanted parts of photographs, adding to photographs parts of other photographs, retouching faces, recomposing the important elements of photographs, repairing poor digital prints, as well as combining different photographs.